Ho ho hum! Here is the first of the Christmasy (!?) covers/pictures for this season. 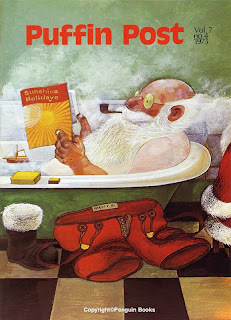 I know that this Raymond Briggs cover is one of the big favorites. Many puffineers remember this as having a wrap-around cover – but I’m afraid it didn’t! The perspective just doesn’t line up – It’s still very nice though!! I will post the back cover and a mini spread to prove the point. I hope to post a regular selection over the twelve days of christmas (Children allowing!). I am desperately trying to figure out which issue of Puffin Post published by short story about a six-foot-tall frog named Herman who loved peanut butter. I had sent it to Roald Dahl. He sent me back a postcard. It's dated 24th August '72, and says, "Dear April, I loved your story about Herman the frog. I read it aloud to my daughter, Ophelia, who also loved it. I read it to my secretary, Hazel, who giggled. Lots of love, Roald Dahl." Somehow I’ve managed to hold onto this postcard for what’s been nearly 40 years. What his postcard didn't say is that he also shared the story with an editor at the Puffin Post. She contacted me and asked to publish it. I would desperately like to figure out which issue it was. I think it might have been in the later half of 1973, or maybe even early 1974. Could you help? I truly believe Roald Dahl helped start my writing career. I'm now a NYT bestselling author.